Film negatives, I have a ton of them. Three shoe boxes and several assorted envelopes scattered around. Many of them are photographs that were lost long ago. I’ve been wanting to know their secrets, but I never had a scanner that could scan color negatives. Now I can scan them with the Epson Perfection V550 Photo Scanner. Scans documents, photographs, negatives, and slides. Holders for negatives and slides of varying sizes. These fit everything from older large negatives to 110 film. Though this unit can scan documents, slides, and both B&W and color negatives, I got it primarily to scan color negatives. But, I’ve tested it out on a variety of negatives and photographs. It didn’t come with a manual or documentation outside of a simple set up sheet, so there is a slight learning curve. B&W negatives were easy to work with, but the color negatives were a bit more tricky. It took a few strips, okay several, to determine the best settings. 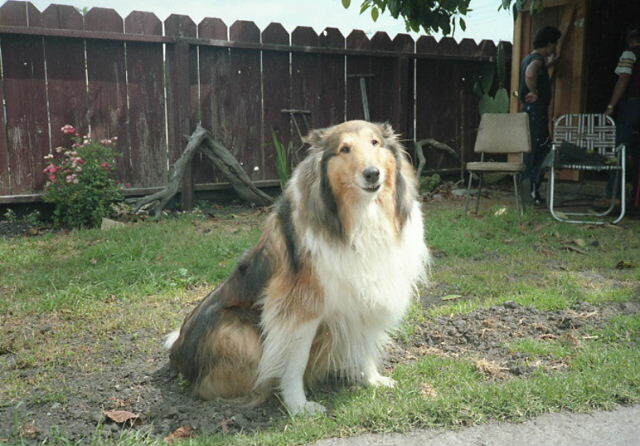 Color restoration works great at bringing out the original colors. However, it works well on some images, but not others. There are times when scanning whole negative strips is fine and when cropping each frame is better. Trial and error is often the best way to figure out how to get the best results. The holders are really helpful especially for 35mm film negatives. The scanner can detect each frame in preview and give you a thumbnail image. When using the holder for larger or smaller format negatives, detection is hit and miss. 110 and disk film negatives fall into a category all by themselves. They both are a pain to scan. I didn’t relish working with either and wasn’t too thrilled with the results. The format is more at fault than the scanner. They didn’t make good quality prints to begin with. How Did the Scans Come Out? The scans are beautiful! Though it takes a little practice to figure out what works best, you can bring out quality B&W and color photographs from negatives with minimal work. 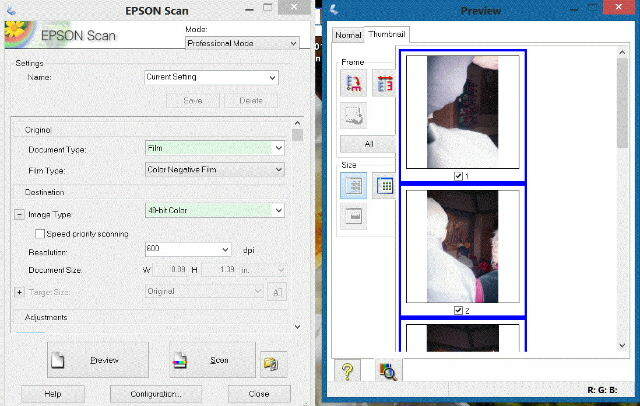 In most cases, you don’t have to do much to manipulate the final scan to restore colors or make B&W images easier to see. This image came from a rolled up negative that’s been sitting in a box since the 1950s. 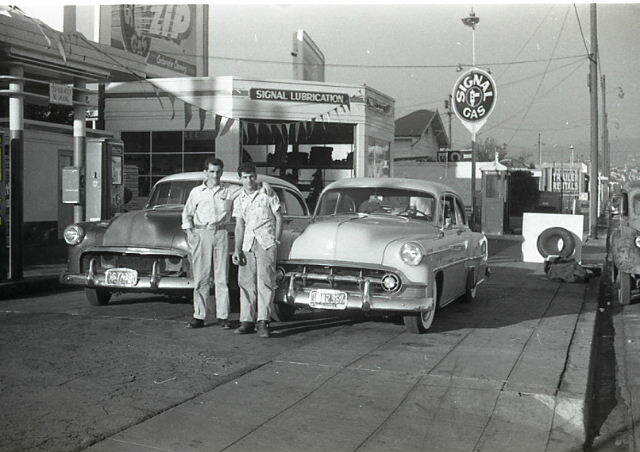 That’s my dad and his brother at the gas station they owned. You can re-orientate each image from the preview screen to get them facing the right direction. You can invert them as well as flip right to left. You can do this as a group or individually. I have not figured out all the settings. 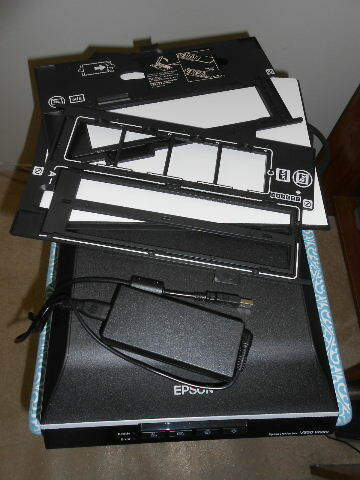 I’ve tried back light, color restoration, and ICE Technology. While I found the back light useful for lightening dark images, the color restoration useful for outdoor images, I have not figure out the best way to use ICE Technology. It’s supposed to help remove dust and specks. To me, it seemed while removing spots on negatives, it over corrected creating a fuzzy image. I probably have not learned how to use it correctly. Slides are even easier to scan. Because they are positives, there’s nothing to scanning them. You don’t have to manipulate them at all. The colors are very rich and true. It Works Great for Photographs, Too! Although I’ve spent most of my time scanning negatives, I’ve tested the unit out on photographs, too. It’s no secret that I hate scanning photographs. I can’t think of many tasks that are more tedious. Maybe paper shredding and cleaning the bathroom. I used to pay my niece to scan them for me when she was younger and easier to manipulate with a $5 bill. The thing that is awesome about this unit is it can detect and crop the images for you. 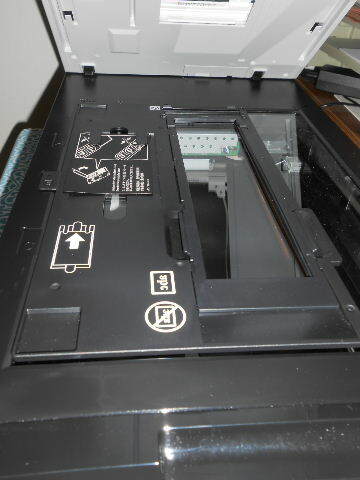 Place several photographs on the scanner bed and it figures out where the images are. No more individually drawing frames about each photograph! This was one of those small prints from the 1940s (2 inches maybe?). Look how clearly the faces of the party-goers came out. There really isn’t much wrong with this scanner. With very little effort you can scan awesome images from negatives and slides. My biggest beef is that the settings don’t stay the same from one scan to the next. You have to click on color restoration each time you put in a new group of negatives, for instance. The “All” button should be on the screen where you name the images because I never remember to click it before each scan. Chalk that one up to user error. I have a lot of duplicate first photographs because I click scan and then realize I didn’t click ALL on the preview screen. Another pet peeve is the connector that plugs into the battery adapter does not fit tightly. The adapter box is a bit heavy. When moved, the connector can fall out. Depending on which end you are holding on to at the time, it’s a good way to get conked in the head or foot. It’s awesome! I’ve scanned several thousand film negative images in just a couple of weeks and I have not been disappointed with the results. I love the holders and the ease of scanning large negatives and 35mm. 110mm and disc film are more difficult to work with. Luckily, I didn’t have many of those. I also love that most of the time it can detect the images, so it’s simply place negatives in holders, preview, scan. 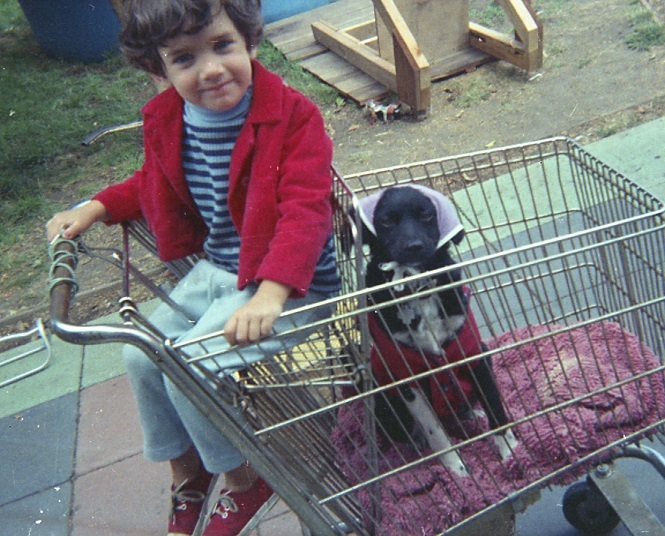 It was easy to scan this color negative of myself and our dog, Bubbles. Don’t ask about the bandana and matching red jackets. I would recommend this scanner to anyone who needs to scan negatives. While there are workarounds for B&W negatives, you need a scanner that is set up to handle color negatives. It’s done well with negatives that aren’t flat. I was even able to scan 4 rolls of developed film that had been rolled up but never cut into negative strips. They’d been in a box since the mid-1950s! At $165, it’s a little bit pricey, especially since a 2 in 1 printer and scanner can be had for less than $100. The problem is most can’t handle color negatives. The Epson V550 has done a great job on a variety of negatives. If you’re looking for a way to preserve the images on your old film negatives and developed film, it’s the way to go! I enjoyed your comments on the V550. I am trying to scan 35 mm color negatives and it keeps cropping the heads off in the preview. It is like it doesn’t see all the way to the edge of the strip. Did you run into this problem? Nancy, I had similar problems. It didn’t always detect each negative frame correctly. You can override this and manually draw around each frame so that it scans the frames correctly. I don’t have my scanner hooked up at this moment, but if you need further instruction on how to do this,I’ll be happy to help.